So one of the nerdier things I collect is LEGOs. Like, a LOT of LEGOs. I'm working on a pretty big collection, which sites like Brick Owl is helping with. Or enabling, depending on whether you consider this a hobby or an addiction. In any case, one thing my collection was lacking was a DC Comics Captain Marvel figure. 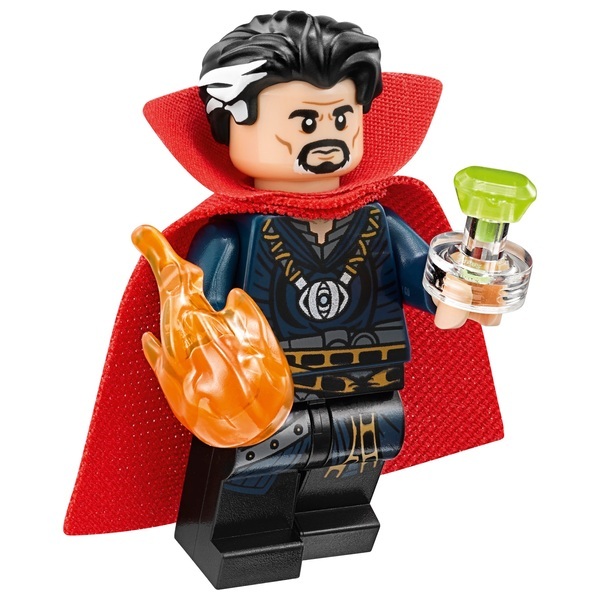 Which is understandable since the only LEGO Captain Marvel figures were convention exclusives, and even when they're available, they sell for hundreds of dollars. Unless it's an actual building or a really big vehicle, I ain't paying hundreds of dollars for LEGOs. Besides, the official Captain Marvel figure doesn't look very . . . well, Cap. I think Cap and Billy came out pretty good, if I do say so myself. I might post up other picks from my collection, but for not, just something I thought I'd share. Nicely done, although the double cape seem a bit overkill. I figure I could at least put as much effort into Cap, given I vastly prefer the "over the shoulder" cape he sports classically. 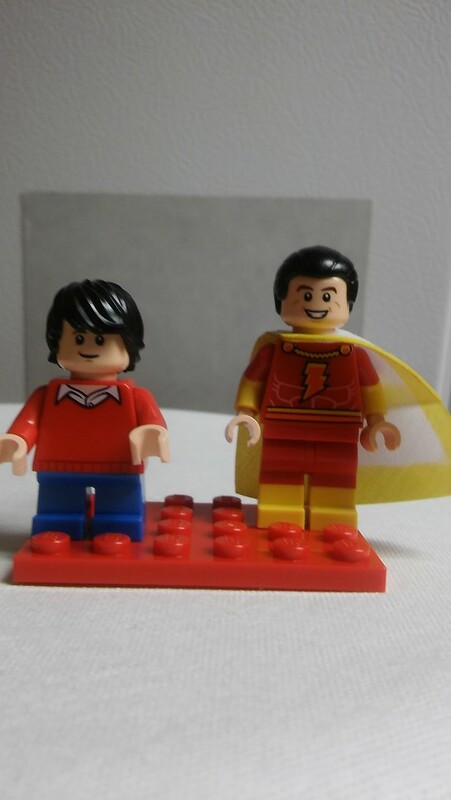 Did you find pieces that had the red legs and yellow boots and red and yellow arms? 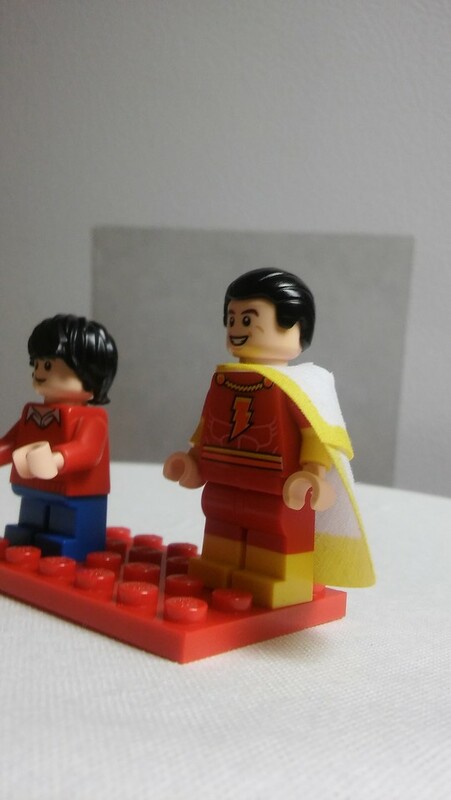 I like the double cape; I realised immediately what you were going for. It looks a little big, but that can hardly be helped. Yeah, I had to get a little creative there, and I almost hate to say how I managed it to avoid ruining the illusion, buuuuuuttttt. . . .
Basically the arms are taken from a Bart Simpson LEGO figure, who is wearing a red t-shirt. Because of how low the shirt is on the arms there's just enough red to give the illusion of red sleeves and gold armbands. For the legs, that's actually a LEGO townsperson in a swimsuit, the red is actually swim shorts and the yellow is the rest of their legs. But a little creative application and you can accomplish a lot. Yeah, it's a little long, but I can't really shorten the cape without shortening the collar, and I can't really shorten the collar much without creating issues. 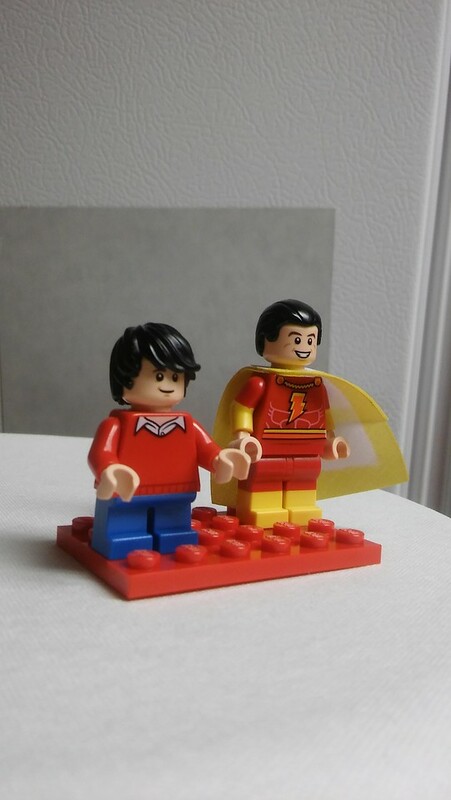 The main heroes of the Death and Return of Superman. 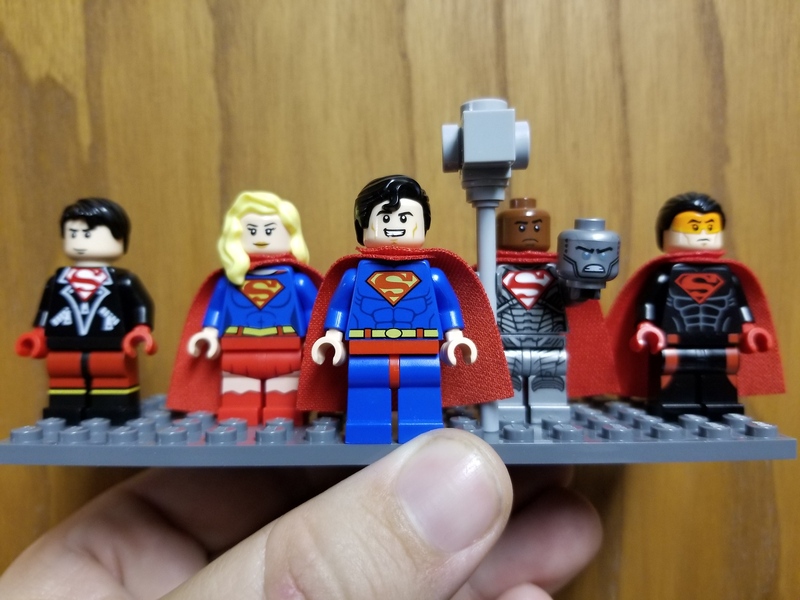 Superman and Supergirl are strictly LEGO figures (though I might swap out Superman's legs at some point for ones with red boots), but Superboy, Steel and the Eradicator are all characters I cobbled together from other sets. Steel is a Dr. Who Cyberman with a custom hammer, red cape, and the head of one of the Zanes from LEGO Ninjago for the helmet he's holding ( I don't recall where his unhelmeted head comes from). 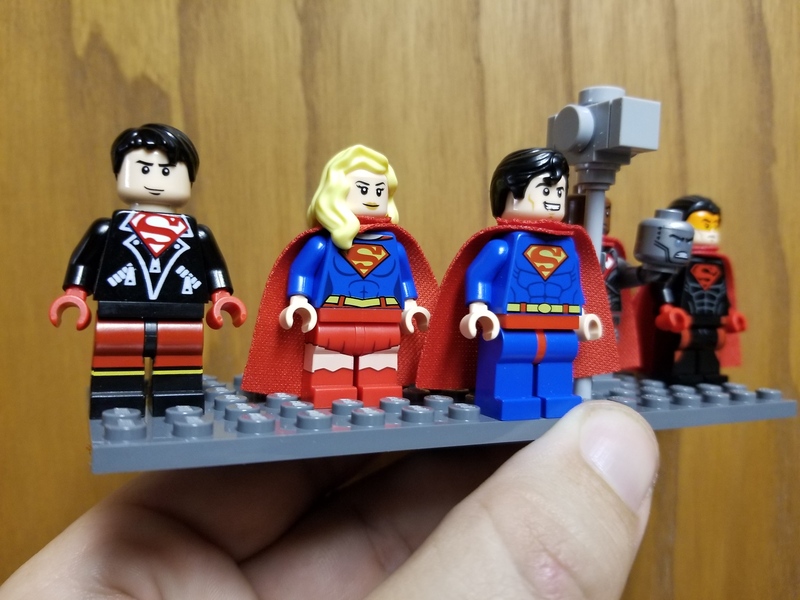 Superboy has a Lego Biker's torso on Plastic Man's legs (for some reason they gave Plas boots and pants, which I'm correcting), with an appropriate head. 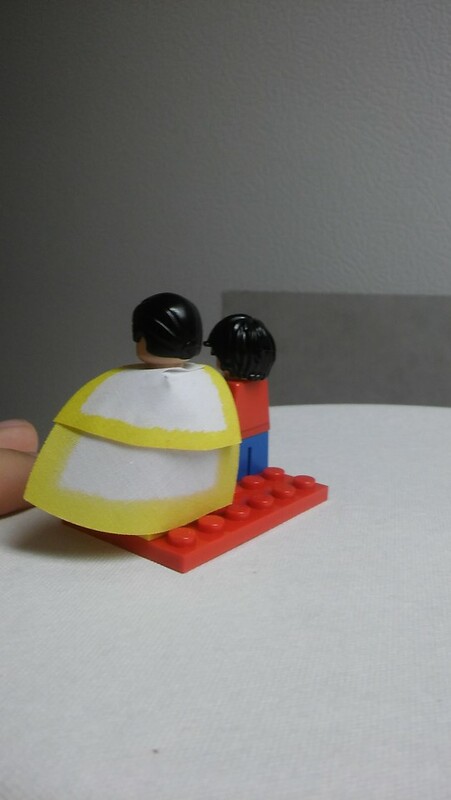 In both cases, I also found some LEGO Sticker Sheets with an S-Shield of the right size on them to complete the look. 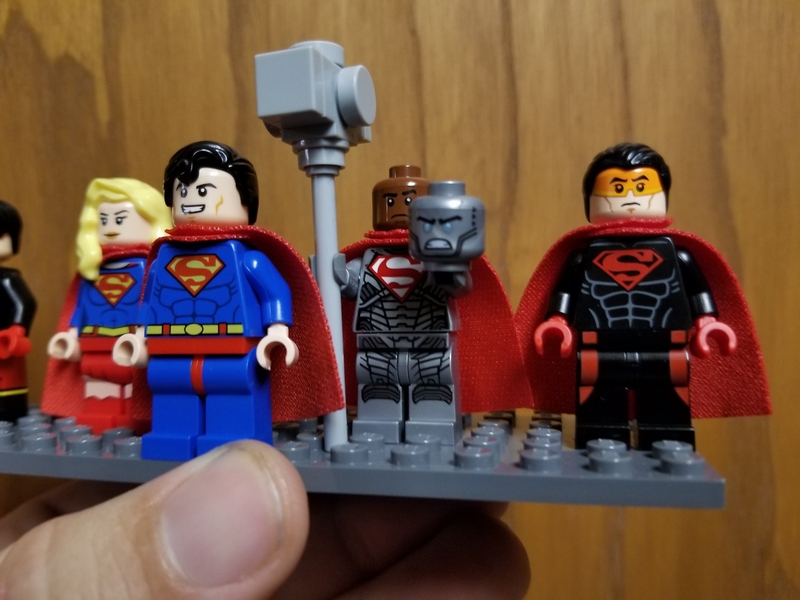 The Eradicator's head comes from a Hydra Agent, I believe, along with a torso I found on an official Superboy LEGO (IE, the one based on the T-Shirt and Jeans era), black arms, red gloves and a cape. I don't remember where the legs came from, but they fit.